MindSnacks Spanish is a language-learning app developed by MindSnacks for an iPhone, iPod Touch, and iPad. Headlined by a mustached slug in a Spanish hat, this informational program costs $4.99 with the introductory 50% discount offered. MindSnacks comes equipped with all the tools necessary to be—if nothing else—conversational in Spanish. This app is not just your average, run-of-the-mill crash course in Spanish. It includes complex exercises, challenges, and lessons that make the learning process fun and effective. I was playing with it all day hoya (today) and I can already recite a number of words (mainly numbers and days of the week, which make up the first and second lessons, respectively). There are 50 levels with up to 25 Spanish words and phrases per level. At any time you have 5 options available to you on the bottom bar including Games, Lessons, your Profile, Challenges, and Community. The Lessons are straightforward in that they are listed in a row with a picture and the word written in English and Spanish, and when you touch the line you can hear the word spoken aloud with an audio clip. You can toggle between current lessons and completed lessons at any time. The Games section corresponds with the current level or lesson you happen to be on. There are 6 games, which, as you rise through the levels are revealed to you one by one. 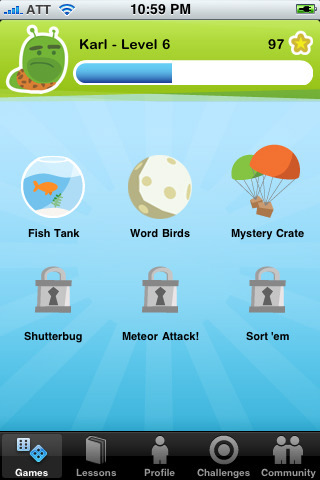 So far I have played Fish Tank, Word Birds, and Mystery Crate. Each game is fun, appropriately challenging, and does wonders to engrain the word or phrase into the memory. As you play the games challenges pop up to keep you on your toes. There are a total of 16 offered. The Profile section gives you your stats including how many points needed to get to the next level, your weekly activity and accuracy, how many challenges you have completed, and the number of items in a row you have mastered without error. There is not one complaint I have about MindSnacks. The developers have done an excellent job in creating an app that is both enjoyable and educational. It does wonders to help me retain todo. AppSafari review of MindSnacks Spanish was written by Vanessa Paszterko on October 3rd, 2010 and categorized under App Store, Developers, Education, Featured, Fun, Games, Productivity, Spanish. Page viewed 7107 times, 1 so far today. Need help on using these apps? Please read the Help Page. to Southern California. Crazy addictive, and I’ve started talking basic Spanish with people down here. Definitely puts you on the right course!